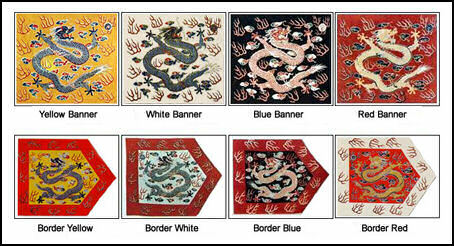 Chinese dynasties were not like the royal houses of England, branches of a single line. It was possible for the founder of a new dynasty to be a commoner or have come from a non-Chinese ethnic group. Their legitimacy was based on their ability to restore or maintain order and govern. Years in China were traditionally marked by the number of years a certain ruler reigned. Imperial symbols included the colors yellow and purple. The Emperor wore yellow robes and lived under roofs made with yellow tiles. Only the Emperor was allowed to wear yellow. No buildings outside those in the Forbidden City were allowed to have yellow-tiled roofs. Purple represented the North Star, the center of the universe according to Chinese cosmology. The dragon symbolized the Emperor while the phoenix symbolized the Empress. Cranes and turtles--traditional longevity symbols--associated with the Imperial court represented the desire for long reign. The numbers nine, associated with male energy, and five, representing harmony, were also linked with the Emperor. There were three ruling Empresses. Early Chinese monarchs were both priests and kings. The Chinese people believed that their rulers were chosen to lead with a "mandate of heaven"---the Chinese belief that a dynasty was ordained to rule, based on its demonstrated ability to do so. It was a kind of political legitimacy based on the notion that the overthrow of ruler was justified if the ruler became wicked, lost the trust of the people or double-crossed the supreme being. The “mandate of heaven” was first adopted during the Zhou Dynasty (1100-221 B.C.) and was described as a divine right to rule. The philosopher Mencius (372-289 B.C.) wrote about it at length and framed it in both moral and cosmic terms, stating that if a ruler was just and carried out the prescribed rituals to the ancestors then his rule and the cosmic, natural and human order would be maintained. Later the mandate idea was incorporated into the Taoist concept that the collapse of a dynasty was preceded by "Disapprovals of heaven," natural disasters such as great earthquakes, floods or fires and these were often preceded by certain cosmic signs. According to these beliefs on September 8, 2040 five planets will gather within the space of fewer than degrees "signaling the conferral of heaven's mandate." The legendary emperors did not need to govern at all because the moral certitude that emanated from them was enough to bring about peace and prosperity. One ruler is said to have done nothing but reverently face the south. Unlike Japan, whose emperor came from a family that descended from gods and therefore could not lose his power to rule, China was ruled by a dynasty whose mandate to rule could be taken away if the emperor violated his special relationship with the Chinese people. European monarchs traditionally had trouble claiming any kind of divine mandate. Chinese history has traditionally been interpreted as a cyclical, astrologically-connected growth and decay of dynasties. The fuzzy, ambiguous aspect of the mandate known as the "right of rebellion" which allowed new dynasties to rise up and replace corrupt ones, has been instrumental in maintaining China's status as a state. The emperor presided over special religious ceremonies conducted over a special Altar of Heaven that only he alone was allowed to perform. During these ceremonies the emperor approached the altar barefoot, accompanied by an orchestra playing hymns, and prostrated himself before the celestial deities. It was believed that fate of the coming year as good or bad was determined by how skillfully the emperor performed the ritual. The performance of these ritual was critical to receiving the mandate of heaven. Before the ceremony the Emperor went to The Palace of Abstinence at the Forbidden City or the Temple of Heaven to pray and fast. During the three-day fast the emperor could not eat meat or drink wine, have contact with women, make merry or take care of legal matters. There was also a lot of superstition associated with Chinese emperors. Emperors sometimes made decisions based on omens reported to them such as dogs giving birth to snakes, roosters laying eggs, turtles giving birth to adult offspring, frogs eating humans and even strangely-shaped clouds. Students and the their parents still thank the emperors today if the students do well on their university entrance exams. 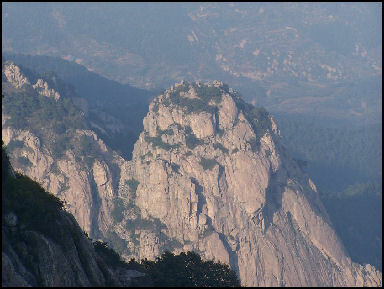 Taishan (near Jinan and Qufu in Shandong Province) is China's most sacred mountain and one of China's most popular tourist sites. Revered by Taoists and Confucians, it covers an area of 426 square kilometers and is 4,700 feet high. Many emperors came here to make offerings and pray to heaven. Poets and philosophers drew inspiration from it. Pilgrims prayed on an alter said to be the highest in China. Confucius is said to have climbed the mountain and proclaimed “I feel the world is much smaller” when he reached the top. The Emperor Wu Di ascended it in his quest for immortality; the great 16th century historian Zhang Dai wrote how he was besieged by souvenir sellers when he made the trip. When Mao reached the summit for sunrise, the story goes, he commented that the "East is Red." Taishan means “big mountain” or “exalted mountain” It is the eastern peak among the five holy mountains associated with the cult of Confucius. The five peaks represent the directions---north, south, east, west and central---and Taishan is considered the holiest because it is in the east, the direction from which the sun rises. For many Chinese it is like Mecca. Climbing it is as much a nationalist and spiritual experience as a recreational one. The Temple of Heaven in Beijing is where the Ming and Qing Emperors worshiped to heaven and prayed for bumper crops during an important ritual held once a year. Described as "the noblest example of religious architecture in the whole of China" and known to Chinese as Tiantan, it was built in 1420 during the reign of the Ming dynasty Emperor Yongle and expanded and reconstructed during the reigns of the Emperor Jiajing and Emperor Qianlong. In 1998 it was recognized as a UNESCO World Heritage Site. 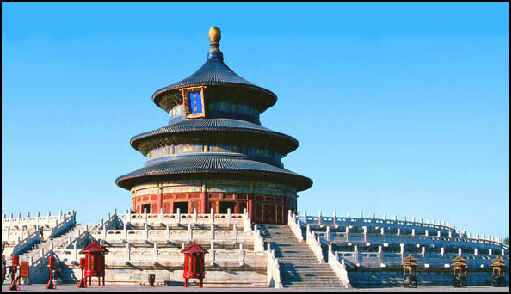 The Temple of Heaven is comprised of several buildings and walls with numerous gates. Each piece of architecture has symbolic meaning. The four central columns, for example, represent the four seasons. The square ends represent the earth, and the semicircles, the heavens. Among the interesting sights in the park are the Imperial Vault of Heaven with a gilded cupola and the three-tiered Circular Alter. 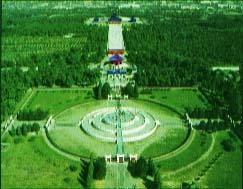 The imperial north-south axis runs from the Temple of Heaven to the Forbidden City to the main Olympic site. The northern parts of the outer surrounding walls of temple are semicircular, representing the heavens, while the southern parts are square, representing the earth. A double wall separates the temple into two parts---the inner temple and outer temple, with the main structures being in the inner one. The whole area covers 273 acres. The inner temples is further divided by a wall into two groups. The north structure embraces the Altar of Praying for Good Harvests within the Hall of Prayer for Good Harvests, the principal buildings used to pray in the spring for fertility and abundant harvests. The south area features the Altar of Heaven was used to worship heaven on the winter solstice. It is made up primarily of a round marble terrace called the Circular Mound. The two altars are connected by a 360-meter-long raised walk called the Red Step Bridge, which is arranged in line with a 1,200-meter-long north-south axis flanked by century-old cypress trees. Near the West Celestial Gate of the south part of the Inner Temple is the Abstinence Hall, where the Emperor fasted before the rituals. A short distance away through the western gate in the outer temple is the Divine Music Office, where teaching and performances of ritual music was carried out. Other important buildings include the Hall of Heavenly Emperor, the Imperial Vault of Heaven, the Beamless Hall, the Long Corridor, and the Longevity Pavilion. Each year, on the winter solstice, the Emperor offered a sacrifice to bring good fortune in the coming year and maintain harmony with heaven. It was the most important event on the emperor's calendar. In the spring the Emperor presided over a harvest ceremony, intended to ensure good harvests in the following autumn. Each ceremony was held at its own altar at the Temple of Heaven. On the day of the ceremony the Emperor traveled with an entourage that included elephant chariots, flagbearers, horse chariots, noblemen, musicians and acrobats to the altar where the ceremony was held. In a ceremony that was closed to the public the emperor chanted prayers and presided over sacrifice of animals on sacred tablets on a round Altar of Heaven. Temple of Heaven Mound Altar Hall of Prayer for Good Harvests (within the Temple of Heaven) is the most famous and recognizable building in the Temple of Heaven. Built in 1420 and rebuilt in 1545 and 1751, it is 38.2 meters-high and 24.2 meters in diameter and boasts three gently-sloped, blue-glazed-tiled roofs topped by a golden ball. The entire building is made completely of wood (no nails or metal braces were used) and is supported by immense pillars, symbolizing the four seasons, the 12 months of the year, the 12 divisions of the day and night and all the constellations. Make sure to look up and admire the lavishly decorated ceiling. The hall is a good illustration of how Chinese numerology works and takes advantage of good luck numbers like the number 3 and 9. It has three stories, representing from top to bottom: the heavens, earth and humankind. 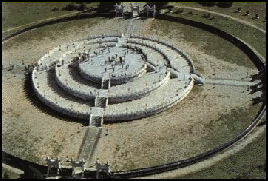 The top level has nine rings, each composed of nine stones, for a total of 81 stones. The middle level has 10 through 18 rings, each with nine stones. The bottom level has 19 to 27 rings, each with nine stones, with final and largest ring having 243 stones (9x9x9). The stairs and balustrades are also organized in multiples of nine. Some regard the Hall of Prayer for Good Harvest as the most beautiful structure in all of China. The original hall was called the Great Hall for Sacrificial Rituals. It was rectangular in shape and was used to worship both the heaven and the earth. The hall rebuilt in 1545 was known as the Great Hall for Offering Sacrifices. It featured a triple-eaved roof of glazed tiles, with each roof being a different color: blue, yellow, and green, representing the heaven, earth and mortal world, respectively. The hall took its present shape when it was rebuilt in 1751. The three roofs were made with azure tiles only and topped by the gilded sphere. It was designated the Hall of Prayer for Good Harvest and was used exclusively to pray for good harvest in the early spring. Temple of Heaven Mound Altar Altar of Heaven (within the Temple of Heaven) was the altar used for conducting the Worshiping of Heaven Ceremony held on the winter solstice. Constructed it 1530, it was regarded as the center of he earth and consists of three marble tiers, representing (from the top down): heaven, earth and man. The altar was originally covered deep blue glazed slabs and then with green stone slabs surrounded by white marble balustrades when't was enlarged in 1749. The balustrades, slabs in each tier and the steps in each flight of stairs are arranged in multiples of the number 9, symboling the 9 layers of heaven. Imperial Vault of Heaven (within the Temple of Heaven) is where the treasures and tablets used in the Worshiping Heaven Ceremony were stored. Built in 1430 ad rebuilt into its current shape in 1752, it is an octagonal tower, made completely of wood and, measuring 19.5 meters-high and 15.6 meters in diameter and has blue tiled roof topped by a gilded sphere. The Imperial Vault of Heaven is a finely interlaced wooden structure with a bluish-green coffered ceiling with a gilded dragon playing with a pear at the center. The Long Corridor, whose 72 rooms stored sacrificial offerings, is now a theater. Hall of Abstinence Palace of Abstinence (within the Temple of Heaven) is where the Emperor went to pray and fast before conducting the ceremony for the good harvest on the winter solstice in the Temple of Heaven. For three days the Emperor could not eat meat or drink wine, have contact with women, make merry and take care of legal matters. 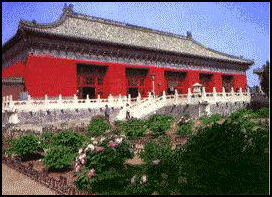 There is a hall that serves the same purpose at Imperial Palace in the Forbidden City. The Palace of Abstinence was built on 1420 and covers an area of 40,000 square meters. Located to the southwest of the Altar of Prayer for Grains, it is square in shape and covered with green tiles, symbolizing the Emperor's obedience to heaven. Among the rooms inside are the Beamless Hall, the bed chambers, a belfry and a stone pavilion housing a bronze statue representing justice and righteousness and rooms for guards, servants and eunuchs. The palace is surrounded by a double wall and double moat.